NOAH stands for Nationwide Operational Assessment of Hazards that was launched as a project of Department of Science and Technology to create an application that integrates real-time information of hazards in the country. It is a joint project of several government agencies and organizations that made this project as one of the most important working project of the government. It feeds real-time and accurate information of various monitoring equipment used by the Philippine Atmospheric, Geophysical and Astronomical Services Administration (PAGASA) and Philippine Institute of Volcanology and Seismology (PHIVOLCS). Schadow1 Expeditions has already been using the information from NOAH in almost all expeditions we take to ensure that we successfully conclude our advocacy or simply to ensure that we enjoy our travels while making sure that we will remain safe along the process. Recently, the information from NOAH as gathered from the real-time feed with PAGASA’s doppler radar at Subic (coordinates 14.822183,120.364015) has saved us from impending danger. We have planned to climb Mt. Pico De Loro of Maragondon, Cavite as early as 5:00 in the morning last June 30, 2013 and we were very fortunate that NOAH has provided information that made us decide to abort the plan. 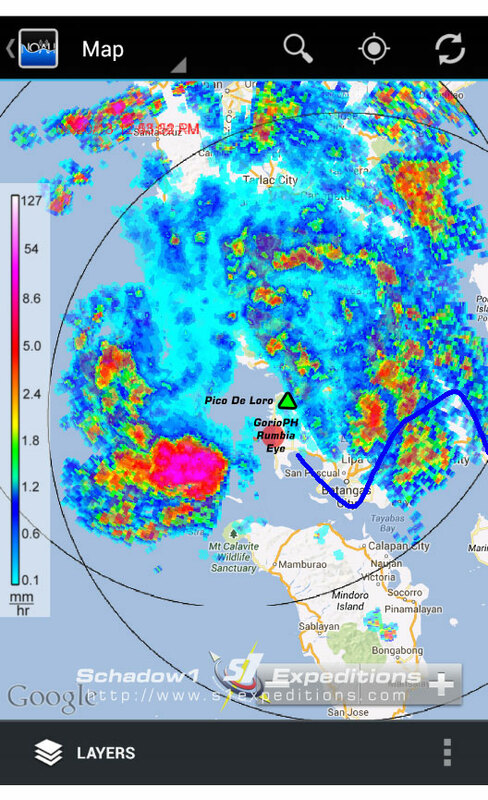 The picture above is a doppler radar feed from PAGASA’s Subic radar station that showed that the eye of Tropical Storm Gorio (intl. Rumbia) is exactly at Mt. Pico De Loro, our supposed mountain destination at the time it was wreaking havoc on the area. The storm was initially predicted to traverse the opposite side of Luzon however it changed its course in a very sharp curve thus hitting our destination directly. This information has made me decide to abort the climb at the last minute. The Project NOAH application is web-based and can be accessed using any browser that is capable of HTML v5 (latest versions would do) through their site at http://noah.dost.gov.ph. An Android application is also available which is has the graphical user interface you see on the screenshot of my smartphone above and is downloadable via Google Play. As of the time of this article, Project NOAH gets its radar feed directly from the doppler radars of PAGASA at Subic, Tagaytay, Cebu, Hinatuan, and Tampakan. NOAH also creates a rain probability guide per town/city which is based from its algorithm of forecasting using the radar data. Temperature, Humidity, Rainfall, Atmospheric Pressure, and feed from the Japanese MTSAT satellite can be selected and be viewed in layers to give you accurate to the hour forecast of the mentioned weather components. You can even set their Android application to send you a notification of rain probability on where you are currently at, so you can prepare when you travel. Flood inundation information is fed in real-time using the sensors at Marikina, Pasig, and San Juan Rivers which is very essential for risk management and evacuation planning. A flood map is also available based on historical data and flow dynamics rendered based on topography as seen in nababaha.com. The Project NOAH is a free application that is a must have for all Filipino travelers, mountaineers, and outdoor enthusiasts. This where our taxes go!